Mum and Dad went to a dinner years ago where Chelsea Clinton was the guest of honour. 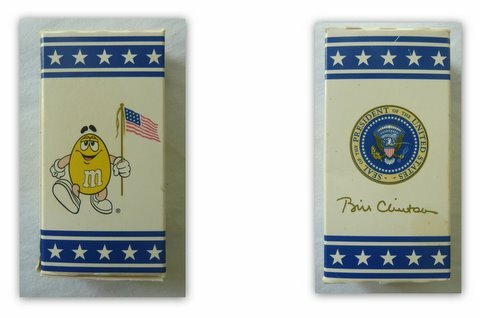 Everything had the Presidential seal on it including the M & M’s. I don’t know why I kept this box, maybe because it was a gift from mum. These are the last of the welcome hexies ready to be posted all over the world. I have just came back from a few days in Caloundra where I met up with a few friends for a small holiday. Of an evening, we would sit around and chat (and drink) and I coaxed Leanne ( a lovely lady we met ) and Angela into sewing some hexies. Fabulous job girls. On my arrival home, I received an envelope from the USA from Sunny (Peggy) with this groovy hexie in it. I love it. Thank you, Sunny. What a very cool treasure – your M7M's boxes and wonderful memories attached to them. Do you live near Caloundra or have you been on holidays there? My SIL lives there, a beautiful part of the world. Gosh I haven't heard that word for a while now, but that hexie certainly is 'groovy'! Keep that M&M box it is so cool. Love the hexies. Your flower from Sunny is great, love the fussy cutting! Keep the M&M boxes! Lovely hexies! What cute mementos. The last thing you would expect to have a presidential seal. All of the hexies you have created are wonderful! Love the fussy cutting in the flower from Sunny. Mine was sent to you a few wks ago, it should be arriving any day now! Gorgeous hexies. Interesting story of the M&M's. Lovely hexie flowers and the one from Sunny is fabulous! Love your hexies! Great fussy cutting and gorgeous fabrics! WOW they are all so pretty. WOW, your garden is growing. You have lovely flowers.